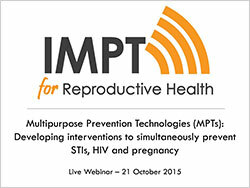 This webinar presented highlights from the MPT panel session at the 2015 ISSTDR World STI & HIV Congress in Brisbane, Australia, co-sponsored by the World Health Organization (WHO), the University of California San Francisco (UCSF) Bixby Center for Global Reproductive Health, the Initiative for MPTs (IMPT) and the Australian Sexual Health Alliance (ASHA). It summarized new research that makes the case for MPTs in the context of overlapping epidemiological need and the prevention of infertility, and an overview of new MPT products in the pipeline—especially for the prevention of sexually transmitted infections (STIs). The webinar featured Anke Hemmerling (UCSF/IMPT), Erin Schelar (USAID), Okeoma Mmeje (University of Michigan), and Bethany Young Holt (IMPT). Hemmerling, A., Schelar, E., Mmeje, O., & Young Holt, B.